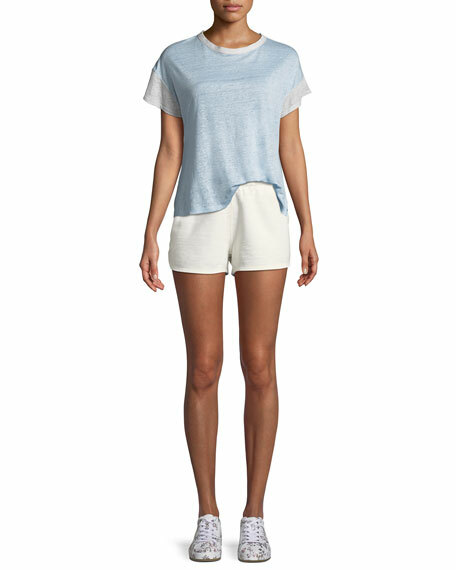 rag & bone/JEAN "Rocky" shorts with raw-edge details. Le Superbe "The Palms" printed shorts. Mid-rise; belt loops. Side pockets. Back flap pockets. Relaxed straight legs. Knee length. Button/zip fly. Cotton. Machine wash. Imported. PAIGE "Jimmy Jimmy" shorts with whiskering & fading. Approx. measurements: 9.75" rise; 3" inseam; 23.5" leg opening. Mid-rise; belt loops. PAIGE "Jimmy Jimmy" shorts with whiskering & fading. Approx. measurements: 9.75" rise; 3" inseam; 23.5" leg opening. Mid-rise; belt loops. Five-pocket style. Straight-leg fit. Rolled cuffs. Raw-edge hem. Button/zip fly. Cotton/spandex. Imported.